Looking to organize a fun and exciting activity for a corporate group, birthday, anniversary, or weekend entertainment? The Escape Games Austin are the perfect choice that combines the trendiest and hottest of challenges, puzzles, excitement, and thrills. Are you an escape game buff looking for the newest and trendiest of rooms to try your skills? Check out our website for information about the latest and most popular options. At Escape Games Austin, we have an expert team of analysts that test and put together recommendations and listings of the best escape rooms perfect for all ages and skill levels. Wondering which are the best escape rooms in the city? Our directory combines detailed customer feedback and reviews that help you make the best choice for a fun weekend. Mistakenly imprisoned with a bunch of hardened thugs and criminals? Now's your chance to break out with your skin intact while the careless guards and warden are in a conference. Austin has a lively, thriving entertainment scene and is well-known for the live performances held here. In addition to the various bars, nightclubs, and restaurants, the city boasts of over 250 live music avenues. These venues like Antone’s Nightclub, 3Ten, and AFS Cinema and Event Hall showcase the talents of musicians in almost every genre. If you enjoy the pulsating, immersive musical shows and extravaganzas then the Escape Games Austin are right up your alley. Sign up for these hard and easy escape games in fun and exciting locales. And, surround yourself with an ambience of suspense, puzzles, and clues daring you to escape in the allotted 60 minutes. The Maze Rooms Austin offers you the experience of live room escape games with sets that mimic the scenes from your favorite movies. You will have a range of tools to solve the puzzles with logic and reasoning. And, find the key to your freedom. 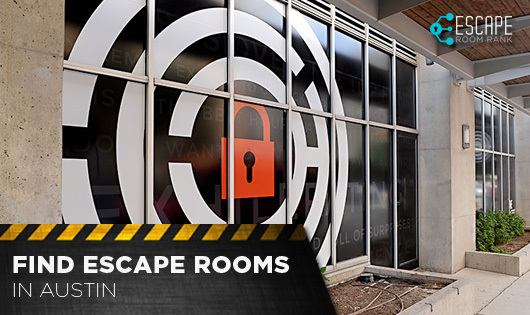 These Escape Games Austin company is a pro in high tech equipment and designing stylish sets. Try games like the Pharaoh’s Tomb or the Soviet Spy Room. The Spy Room gives you a taste of the 70’s era with props and gadgets that are typical of those times. The Escape Game Austin offers a selection of 5 brain-scrambling rooms that you will love to decipher. In the Gold Rush, you’ll be racing the Mob to find a hidden stash of gold. The Classified, on the other hand, challenges you to save the world from annihilation like a Superhero. The Heist has a missing piece of art and dares you to find its location and get it back before the 60 minutes are up. Sneak out of prison while the Warden is away in a conference in the Prison Break. Or, complete your classwork in the Playground to be allowed to go outside for summer. First developed in the year 2015, Lockout Austin is the first of its kind in South Austin. The venue has a series of rooms ideal for small groups of 8 players or less. Currently operating out of South Lamar Boulevard, these Escape Games Austin include challenges like the Blue Meth Breakout Room, WW3: The Conspiracy, and the Shipwrecked Room Adventure. Enjoy unraveling the mysteries of the puzzles with friends, family, colleagues, or as a part of your vacation itinerary in the city. The Austin Panic Room is the brainchild of Robert M. He was so fascinated by an escape game in London that he simply had to replicate the concept for players in Texas. Robert chose an old house and renovated it to create a series of Escape Games Austin. Pitch your wits against the puzzles in the Oval Office, Phase III Human Trials, Cabin Fever, Prison Break, and Abandoned School. Each of the real escape games can be attempted by a minimum of 4 players and the organizers promise you a new challenge every 12 months. Would you like more information about the best Escape Games Austin? You’ve come to right spot. You only need to contact us and we’ll get back to you with all the details you need.